I hear there’s a vicious rumor going around that I’m no longer obsessed with birds, and that it’s based on the fact that I haven’t posted in a long while. Oh, how incorrect that rumor is. The opposite is true. I’ve been so busy birding I haven’t had the time to go through my photos every day to decide what to post. Plus, there’s that day job. 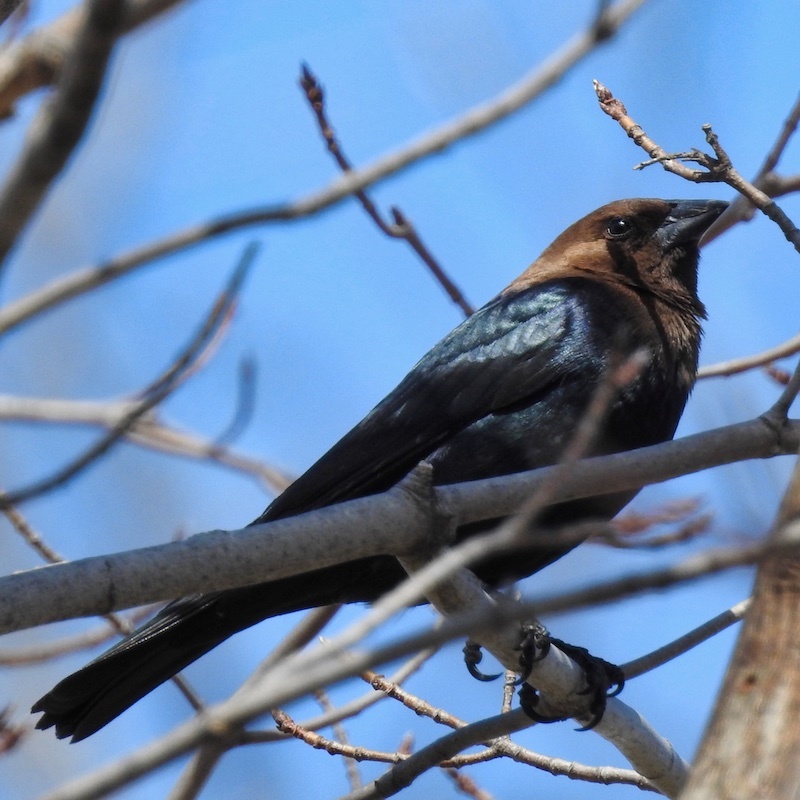 But spring migration is in full force, and yesterday I saw a first-for-me bird: a male brown-headed cowbird! So I cannot resist the temptation to blog again. The brown-headed cowbird is not a rare bird. Nor does it have a limited range or highly specific habitat requirements. It’s quite common in cities. It loves soccer fields and lawns. So how is it that I’ve never seen one before yesterday? The answer is I probably have, but didn’t notice it. Brown-headed cowbirds aren’t big, flashy birds. The males are black with glossy brown heads whose color is hard to see outside of direct sunlight. The females are brown. Neither are much bigger than house sparrows, so it’s easy to miss them when they’re perched in trees. When they’re on the ground, they often gather among other black-feathered birds like starlings and grackles. The males don’t stand out, since they’re smaller and lack the rainbow iridescence of the larger birds. And the females, in that context, may easily be mistaken for sparrows or finches if you don’t focus in on them with a good pair of binoculars. Upon spotting this brown-headed cowbird yesterday, it took me a minute or two of talking to convince my companion that it was not a grackle. But when the cowbird began to whistle, Companion was convinced. It sounded nothing like a grackle. I thought this was my first-ever brown-headed cowbird. But upon careful study of my guidebooks and websites, I realized I’d seen one before. Last Tuesday, during our (hopefully final) snowstorm of the spring, I noticed a brown bird that was not a sparrow, finch, thrush, or female red-winged blackbird. It was perched on a dogwood branch. I tried to take a picture, but there was snow in the way and the bird flew off before I could focus the lens. I looked up brown birds on my Merlin bird app, but everything it returned was a species I recognized and not this new thing. Fast-forward to yesterday afternoon as I browsed through brown-headed cowbird entries. I recognized not only the male, but also the female. That’s what I’d seen on Tuesday. Brown-headed cowbirds are brood parasites. Instead of raising their own young, they lay eggs in other birds’ nests. Upon hatching, those young may kill other birds in the nest by pushing them out, or lead indirectly to their deaths by hogging all the food their adoptive parents bring. Some bird species recognize brown-headed cowbird eggs and push them out of their nests or build new nests over them. But other bird species can’t tell the difference and raise baby cowbirds as their own. Many people villainize cowbirds. Just go to YouTube in search of brown-headed cowbird videos, and you will find see nasty comments directed at the species, including ones that promote their wholesale extermination. I always find these comments ironic. Prior to the large-scale arrival of Europeans to the Americans, brown-headed cowbirds lived among buffalo, which were found through much of the continent but concentrated in what is now the U.S. Upper Midwest and the Canadian plains. When buffalo walked around, they disturbed the grass, and insects flew up out of it. The cowbirds feasted on these insects. Brown-headed cowbirds also favored forest edges, another good place to find insects to munch on. Europeans showed up and slaughtered bison with impunity. They clearcut forests, not thinking about the harm they were causing to the ecosystem. Cowbirds had to find somewhere else to feed. So they spread out, settling down wherever they found cattle disturbing the grasses—which was pretty much everywhere Europeans had settled. Cowbirds followed the spread of domesticated cattle across the continent and now live across most of its temperate zone. This has introduced them to new areas and new birds to parasitize. Some blame them for declines in other songbird species’ numbers. But at its root, the spread and success of the cowbird has a human cause. If I villainized every animal that hurt other animals, directly or indirectly, I’d have to villainize all of them. Particularly those in my own species. Instead, I will appreciate the brown-headed cowbird for what it is, and not expect it to be something else. P.S. If you’re super curious about the birds I’ve seen lately that I haven’t been blogging about, check out the calendar in the sidebar. And feel free to browse my other birding posts!